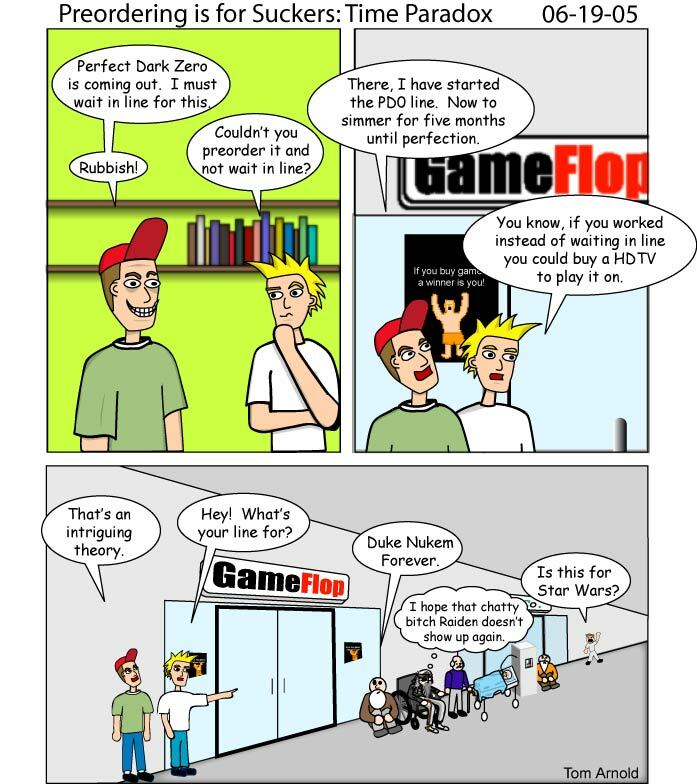 n00b squad - "Pre-ordering is for suckers"
With the upcoming release of the Xbox 360, I only have one reason to get the console and that is Perfect Dark Zero. Long has Perfect Dark’s developer Rareware been in the shadows ever since it was sold by Nintendo and bought by Microsoft. Rareware might as well have missed this generation after only releasing Star Fox Adventures, Grabbed by the Ghoulies and Conker, again. There were a few game boy games too with the only notable one being “It’s Mr.Pants.” (Don’t ask, only Rareware fans need to know). Rareware has been acclaimed for having some of the best looking games on consoles so it is a wonder why Perfect Dark Zero currently looks so bland. The boring graphics could be due to the Xbox 360 development kits only running at one third the power of the final Xbox 360. Rareware will fix this up before the game is released on the Xbox 1080.